New Zealand teems with thousands of different insects. The country’s isolation and temperate climate have given rise to a distinctive insect fauna. More than 90% of species can be found nowhere else, and many have evolved remarkably differently from their relatives overseas. 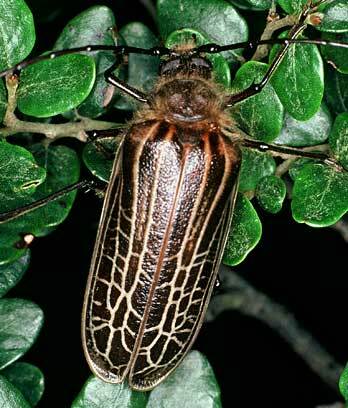 There are about 20,000 different types of insects in New Zealand. Because the country has been isolated in the middle of the Pacific Ocean for millions of years, most of these insects (over 90%) are found nowhere else. Insects are not always easy to see. Many tunnel underground or into wood, or live deep in the bush or high up in the mountains. Small and dull-coloured, they blend in with their surroundings. Among the most striking native insects are wētā, which look like giant grasshoppers without wings. New Zealand batflies depend entirely on short-tailed bats for food, transport and shelter. New Zealand is home to the world's only marine caddisflies, which live on coastal rocks. There some species that are flightless or wingless in New Zealand, but whose overseas relatives can fly. The mole cricket or honi is the world’s only mole cricket without wings. Because it has no wings to rub together to make sound, it is silent. New Zealand has only about 20 species of butterfly (compared with 364 in Australia). The most common are red admirals, which are often seen fluttering around gardens or parks. There are 28 species of native bees. They are small and have short tongues, which means they cannot pollinate many types of flowers. In the mid- to late 1800s, European settlers introduced honey bees and bumblebees to pollinate the plants they had brought over. These bees are now widespread. Some insects, such as painted lady and blue moon butterflies, have flown long distances across the ocean, helped by westerly winds. They usually do not successfully breed in their new home. Some introduced insects have thrived, and have become pests. For example, painted apple moths are a threat to crops and native plants, and salt marsh mosquitoes may be a danger to humans, and are often sprayed.